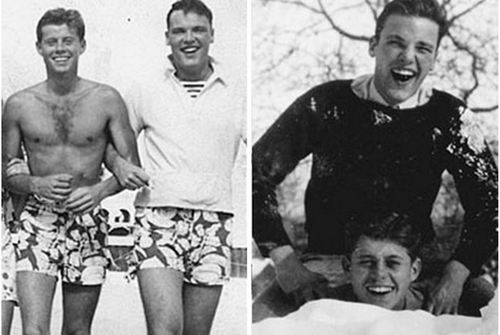 A new book titles “Jack and Lem: John F. Kennedy and Lem Billings: The Untold Story of an Extraordinary Friendship,”explores the close relationship between “Lem” Billings, a gay man JFK met at Choate, until the President’s assassination thirty years later. The pair became the best of friends who wrote letters to each other when they were apart, traveled to Europe together and were so close that Joseph Kennedy Sr. thought of Billings as another son, and Billings had his own private room at the White House. Kenneth Hill: How would you characterize the friendship between JFK and Lem Billings? David Pitts: The way I would characterize it is that is was a very close, deep, friendship across sexual orientation lines. KH: You said that this was the story of a friendship that crossed sexual orientation lines, which I think is really an interesting element of it, but talk a little bit about the depth of this friendship. The fact that it started when they were very young and, from what I read in the book, they were basically inseparable for the rest of their lives except when circumstances had them in distant cities. DP: Yes, indeed. I think there were a number of elements to it. First of all, there were a series of bonding events early on. One was the fact that they both hated that school [Choate] in which they met. And were engaged in all kinds of pranks which almost got them expelled twice. That was obviously a bonding phenomenon. Secondly, they roomed together for part of the time at the school. Thirdly, and I think this is really important, John Kennedy was so sick most of his life, far earlier than when most people think, including when he was at Choate, and Lem was the person at boarding school — his mother and father did not come to the school when he was ill; Lem was there. Lem was the person who was always there for him and took care of him. And then fourthly, there was the two month trip to Europe that they took, just before WWII in 1937, just the two Americans at that pivotal time, I think that was obviously a very strong bonding event. And then over and above these issues, I would say this — and this is kind of a complicated thought because we really don’t have language to express these kinds of relationships — and that is, I’m firmly convinced after working on this book that John Kennedy’s sexual interests were in women. We don’t need much evidence of that, the evidence is all over the place. But his strongest emotional attachments were to men — and principally, to Lem. We don’t have a word for that, right? Somebody who prefers the opposite gender for sexuality, and the same gender for deep, emotional attachments. KH: We don’t really have a word for that. I guess “man’s man” used to sort of mean that, but JFK took it so much further in a way because he loved being around men, he knew some men were attracted to him and even seemed to enjoy it. He liked the stimulation of those relationships, there was nothing sexual about it, but there was something about that male-male dynamic that fed him. DP: I think that’s exactly right. There was one reviewer who wrote, “What’s the big deal here? This guy’s writing that JFK was comfortable with gay men, so big deal, we all knew that.” But of course it’s not the fact that he had a friend named Lem Billings who was gay. This was the closest person in all the world to him outside of his family for 30 years. He wasn’t just “a gay friend” on the side. You can read more of the fascinating Q&A interview here. Jack and Lem: John F. Kennedy and Lem Billings: The Untold Story of an Extraordinary Friendship is available at Amazon.com. By purchasing the book using the link provided here Back2Stonewall.com will receive 4% of each purchase to help with out operating expenses.